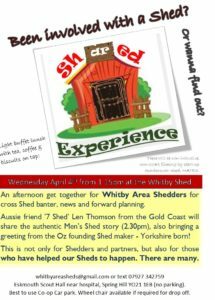 It’s a Whitby Sheds Get Together but also for our supporters (including our valued referrers and funders!). It’s also for people to find out more about Sheds and what they “really are”. It will be a relaxed afternoon at Eskmouth Scout Hall, home of Whitby She Shed and Whitby Men’s Shed (WHIMS). News will be shared, including from elsewhere, banter can be bantered. At 2.30pm Len Thomson (with wife Ros) will be interviewed with the aim of bringing out the trend in Aussie Shedding (there’s a lot about health focused on) and the differences Len perceives in their way and the Whitby way:-). Any questions to whitbyareasheds@gmail.com or 07763 656627.